What Constitutes a Neko in Second Life? Are we defined by skin, personality, fashion or mannerisms? Are we grungy, outspoken and outrageous; shy, kawaii and delicate; or just a regular avatar who wears and does what she pleases, when she pleases? 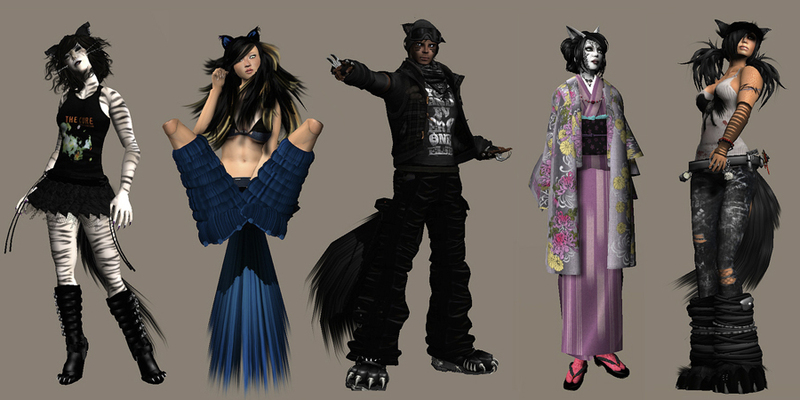 My friend Ewokian has begun a project in which he hopes to prove that a Second Life Neko is all of these, none of these, and everything in between. His believes most of us are just like cats: you can’t really define us, you just have to take each one of us for who we are, with perhaps the only common denominator being our kitteh bits. His medium? Photography. His goal? To capture the essence of Neko and show how unique each one of us is. The process? Simple! Pick your favorite outfit, pick your favorite pose, and drop him a notecard. He’ll take the photo and do the rest. The result? A “Neko Retrospective” on Flickr, cross-posted to Koinup, and eventually made available for viewing in-world (I’ll keep you updated). I’d like to urge each and every one of you to reserve a time to have a photo taken for this historic retrospective of Neko in Second Life (not just you outgoing Neko, but you elusive shy ones too, please!!) Whether you are a respected oldbie from 2003, a “middle aged” Neko from 2007, or a relative newcomer in the last year… whether your favorite outfit is casual, fashionable, kawaii, kimono, cyberpunk, cosplay, fantasy, steampunk, grunge, gangsta‘ or roleplay gear… each of us represents what it means to be Neko in Second Life. So let’s show ’em! Please note: this is not a paid photo shoot… you are volunteering to have your picture taken. Ewokian will not photoshop these images (except to correct anomalies like a skirt going through a leg), so the photos will represent exactly how you look. ~ by Stacia Villota / Virtual Neko on January 8, 2011. Really nice! I’m a retired high end neko model that got into the mainstream fashion world as a neko in 2007 and maintained a neko presence through my time modeling and djing. I recently retired and my last runway show was as a Neko ^^ thanks for sharing this I’d love to be a part of this project as one of the few mainstream neko models. RAWR! I don’t get tired of thanking you my dear Stacia! I had a great start two days ago, especially after the notice you sent in world to the neko community. Already made some new friends in the process and met interesting nekos that made me laugh and showed me new things and offered some suggestions. I’m having so much fun with this project, not only because I love taking picture but mainly because this way I can have an active role promoting the neko lifestyle. Something that I already got used to hear, from nekos that teleport to have their picture taken, are comments about how different each one looks and the fact there are so many walking the streets in SL. Some even told me they wished they knew more nekos just by looking at the pictures.